Gertie, aka Gunpowder Gertie, is a 4½-year-old red fawn female born October 16, 2007. Her sire is Maryville Rumble, and her dam is Hoops Slamdunk. 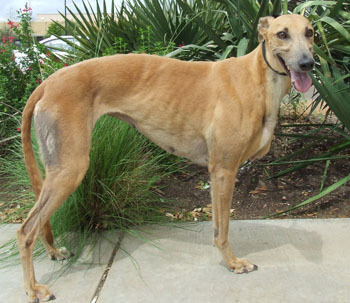 Gertie has no races to her credit on Greyhound-data.com. She was injured in an accident at the farm after returning from the track - her left front leg has been amputated, but that hasn't stopped Gertie from getting around quite well. Gertie can still hop around with style, and would like to hop right into your heart! 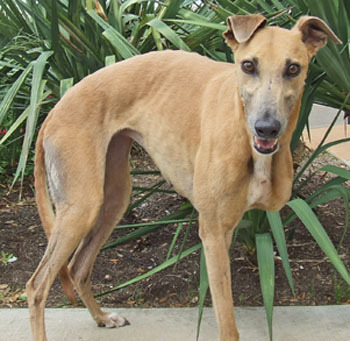 Gertie is not cat tolerant and has yet to meet any small dogs. Maybe it's the tripod in her, but Gertie is fast and strong for such a little girl. She has done very well for just recently living in a home for the first time - no potty accidents at all! She's still getting accustomed to being a pet, so for the time being, she is crated when no one is home. Although she's not fond of her crate, she does relax and nap once she's inside. There are still a few things she is learning about, like the dogs barking on tv are not hiding somewhere in the house, and food will always be there so there's no hurry. She loves food - maybe a little too much. It is her favorite thing. I try to keep her weight stable so she doesn't put too much strain on her front leg. The quest for food is a very serious matter, in her opinion. Gertie sleeps thru the night and is happy on the carpet or on a dog bed. She likes to roach but needs help keeping her balance so something to roach against like a wall or doggie bolster bed with the nice edges helps her out. She is definitely a velcro dog and will follow you from room to room. She also loves to cuddle and give kisses - lots of kisses! Because she only has one front leg, she doesn't have the same ability to balance herself and scratch with her hind legs the way most dogs can (yes, she can still scratch herself, but it's just not quite the same), so she really appreciates those scritches and leans on you when she really gets into them. Gertie is still honing her car riding skills but she has proven she learns quickly and I have no doubt she will soon understand it's not her job to drive. 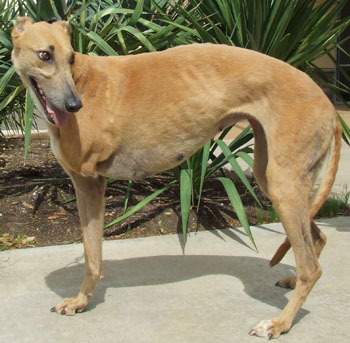 Gertie loves people and gets along with her grey sisters and the Border Collies next door. You can tell how happy and excited she is to be a pet! She's ready to give all her love to you!